Editor's Note: This entry was written November 2, 2007 for the current issue of Exposure, the quarterly magazine of ASMP New Jersey Chapter. There’s no doubt in my mind that I’m a true professional when it comes to my work as a photographer. I take excessive pains to be certain that whatever picture I’m commissioned to make gets made and delivered as expected, “no IFs, ANDs or BUTs.” I learned professionalism during my apprenticeship at the feet of several masters, and my favorite lesson is the one that could have been the most catastrophic failure had it not been for a back-up. In May of 1980 I was first assistant to Klaus Lucka, a photographer who was shooting a major ad campaign for Raleigh Lights (cigarettes). 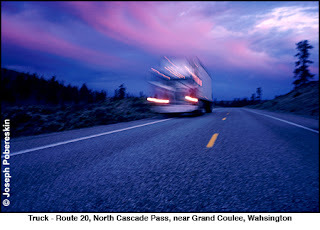 The ads revolved around a truck driver and were photographed against the dramatic and magnificent backdrop of Washington’s North Cascade Pass. The mountain locations were exceptionally beautiful and we were well into the execution of a finely crafted campaign which involved three weeks of location shooting. One Sunday morning, about a third of the way through the shoot, we allowed ourselves the luxury of sleeping-in rather than our usual 4:30 AM call, but it was not to be. I was, somewhat rudely, awakened by a loud and urgent-sounding pounding at my motel room’s door just before eight o’clock. I hurried to the door and opened it, fully expecting to find that my idea of sleeping-in and Klaus’s idea of sleeping-in were not in synch. But instead of seeing an impatient, frowning photographer at my door I looked out upon a parking lot, empty save for all the cars in their places. I stood in the doorway, in my underwear, surveying a surreally quiet, peaceful, serene motel parking lot with nobody in-sight. Despite the fact that I was mostly naked I stood there a minute, trying to decide if I’d been dreaming or if I actually heard something. I went back to bed. Just about the time I fell asleep, and it wasn’t long, I heard the pounding on my door again. I got out of bed once more and went to answer the door again. This time, everyone in the motel was standing in their doorway in their underwear. What was that noise? That noise was the sound of a volcano erupting 300 miles away. Mt. Saint Helens had blown her top and our plan for that Sunday morning was to head in the eruption’s direction for another week of shooting. Unwillingly wide awake, we all headed for the restaurant and, over a breakfast of blueberry pancakes, a very nervous account manager was losing his composure in the face of impending disaster. We had purchased a new, custom-painted in the brand’s colors, Kenworth tractor and a gleaming white Frauhauf trailer (about $160,000 +/-). We were one high-priced photographer, two assistants, two stylists, three models, a real truck driver (to drive the tractor-trailer), art director, account manager, brand manager, a couple other tobacco company execs, five other vehicles, wardrobe, props, etc, etc. All that investment was at risk. The account manager was about to come completely and totally unglued right there at the breakfast table and he was looking toward Klaus for a viable solution. Klaus calmly looked at the second assistant, Mark Scott (now a photographer in Los Angeles), who had also been the location scout and he said, “Mark, get the alternate location files from the car, we’ll go east instead of west.” Klaus had a back-up... priceless! I approach every job I do the same way. I make sure there’s always some other way to make whatever picture I’m supposed to make. Failure is not an option. I always have a back-up. Being generally fastidious, having a back-up is a pre-occupation of mine. When someone sends me out, at great expense, to make a picture it’s likely that their job as well as my good reputation is on the line. I won’t allow myself to fail, I always deliver. Not one of my clients has ever been disappointed. Back in the here-and-now, I’ve disappointed myself: I failed to have an adequate back-up in place for some critical business data. What went wrong? By the time you read this it’s likely to be old news, but Apple had just released it’s latest version of the Macintosh operating system, code named “Leopard.” I like to be at the leading edge of technology so I went to the Apple Store at Short Hills and bought a five-pack of upgrades for all my computers. I took it back to my office and prepared to install the new software. The first step in upgrading a computer’s operating system is to insure the integrity of your data by first making a back-up of your computer's hard drive. It’s a best practice. In fact, you should always have a recent back-up of your important data, typically once a week. I sat at my desk and set-up the copying of data files to an external hard drive. I went into the kitchen for a black cherry soda and, though I was only gone for a minute, when I returned something was terribly wrong. The little colored pinwheel icon was spinning but the progress bar was not expanding. Something had stalled. I clicked on the “stop” button, figured I’d start over. I reselected my files, dragged them into the folder I wanted to transfer to and again the pinwheel spun and nothing happened. I restarted the computer, heard the tone, saw the Apple logo, got the spinning wheel icon and breathed a sigh of relief, everything seemed to be okay. The good feeling didn’t last very long. The pinwheel kept spinning and spinning and the computer never restarted. The next step was a no-brainer. I took my computer to the Apple Store and had the Apple Genius run a diagnostic test. The result: my computer's hard drive was toast... well-done... burned to a crispy crunch. My precious data was unrecoverable. The bad news: I hadn’t done a comprehensive back-up since June and I spent the better part of that week’s downtime re-entering data... and Photoshop still isn’t working properly. The good news: Leopard has a feature called Time Machine which automatically backs-up your data, I’ll never (?) be in that situation again. It’s embarrassing for a guy who takes pride in being professional. It’s like standing in a motel parking lot in your underwear. Ah, Klaus Lucka, I remember him well, what a trip to see his name in print, I worked with him in the 90's as a Film Editor on some very cool stuff he shot in New York for Toyota, we got on great, also worked with him in LA, wonder where he is now, ah yes, google, of course, thanks for the article and the Blog, mine is KiwiCafe, if you have time! Hi Joe, I enjoyed reading your blog. The "Back me up, Scotty' article was a great short discourse on being professional.